Between pieces of plastic wrap or waxed paper, place each chicken breast smooth side down; gently pound with flat side of meat mallet or rolling pin until about 1/4 inch thick. Season with 1/2 teaspoon of the salt and 1/4 teaspoon of the pepper. Place flour in shallow dish; coat both sides of chicken with flour. In 12-inch skillet, heat 2 tablespoons of the butter over medium-high heat. Cook chicken in butter about 3 minutes on each side or until golden brown. Transfer chicken to plate; cover to keep warm. In same skillet, heat remaining 2 tablespoons butter over medium heat. Cook mushrooms in butter about 5 minutes, stirring occasionally, until lightly browned. Add shallot and sage; cook and stir about 3 minutes or until shallot is softened. Pour Marsala wine into skillet; heat to boiling, scraping up brown bits from bottom of skillet. Stir in chicken broth, whipping cream and remaining 1/4 teaspoon salt and 1/4 teaspoon pepper. Heat to boiling. Reduce heat to low; simmer about 3 minutes or until slightly thickened. Place chicken back in skillet 2 to 3 minutes or until cooked through (at least 165°F). Remove from heat; stir in lemon juice. Serve with pasta, rice or mashed potatoes, if desired. Sprinkling a little water on the plastic wrap before pounding out the chicken will lessen the friction between the plastic and poultry, which helps to keep the chicken from tearing in the process. White button mushrooms work well in this recipe, but for a change of pace, try a wild mushroom variety like cremini or shiitake. You’ll notice that this recipe calls for Marsala wine is actually a hybrid between wine and some type of liquor like brandy. Like other wines, Marsala can range from the very sweet to the very dry, and should be selected depending on the flavor of your dish. 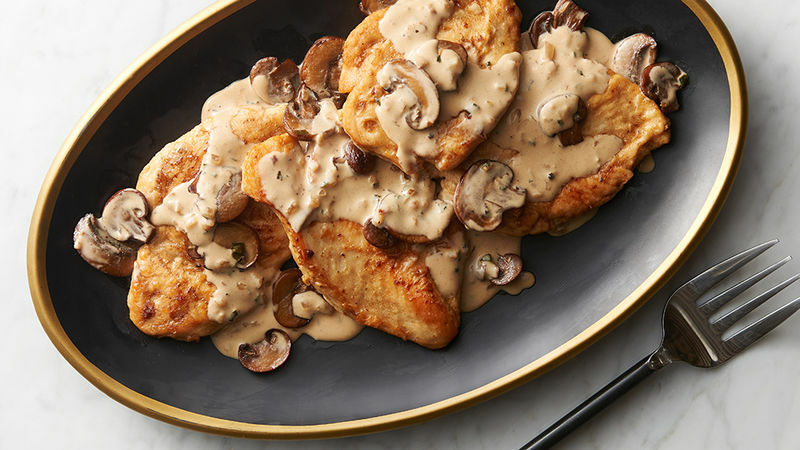 Dry Marsala should be used for savory recipes like this chicken Marsala dinner. Although there is no need to spend a fortune on a bottle of Marsala, a good rule of thumb is to choose a wine to cook with that you wouldn’t mind drinking on its own. If wine isn’t your thing or you accidentally drank it (no judgement! ), chicken stock is a perfectly acceptable substitute. Otherwise, we have wine-free skillet dinners, too!